« Is the Waterpik a Good Alternative to Flossing with Braces? It’s an election year, and there is no shortage of debates – not even in the orthodontics field. One of the most common debates you’ll hear in dental offices is The Great Braces Debate: Invisalign vs. braces. While both products are effective in aligning teeth to create a beautiful smile, each has its pros and cons. Who wins the debate is entirely up to you and your dental professional; but before you choose, learn more about orthodontic options from Pointe Dental Group. Traditional braces are a system of brackets bonded directly to the front of the teeth. The brackets act like handles, holding “arch wires” that move the teeth. The brackets are often connected with a system of bands, spacers, springs, and other mechanical appliances to gradually move and align the teeth. There are several types of brackets, including stainless steel and tooth-colored ceramic or plastic, which are often selected because they’re less obvious. Occasionally, brackets are cemented to the back of teeth in order to hide them from view. These are called lingual braces. The cost of braces widely varies based on the type and the materials used. 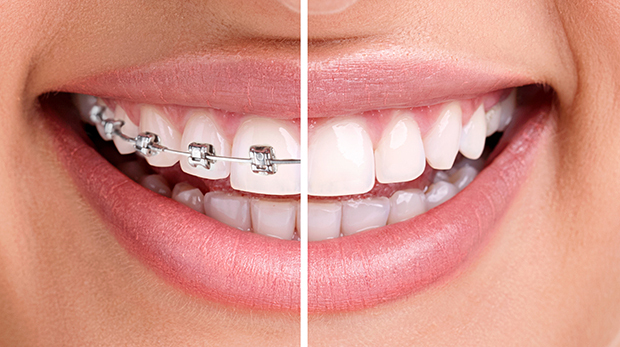 Traditional stainless steel braces usually cost between $3,000 and $7,000, while ceramic braces range between $4,000 and $8,000. Lingual braces typically cost between $8,000 and $10,000. The treatment time, of course, varies based on the patient’s individual needs, but average time to achieve the desired results is two years. Braces are functional and work efficiently for fixing both simple and complex tooth issues. Braces can also be expected to work faster at closing gaps and aligning the teeth than Invisalign. Metal braces are a good choice for candidates who need extensive dental alignments or who don’t have the discipline to wear orthodontic trays for 22 hours a day. Traditional braces also work with patients who have back-tooth bite issues, need to rotate canines or premolars, or move teeth vertically. Metal braces are not a good match for patients who regularly play rough contact sports. Invisalign – and other clear aligner therapies – are relatively new orthodontic treatments used to align teeth. They consist of a series of 18 to 30 custom-made, mouth-guard-like clear plastic aligners. The aligners are removable and are replaced every 2 weeks. trays do not interfere with eating or speaking, and they’re less likely to irritate soft tissue surrounding the teeth. The average cost of Invisalign is $5,000. If you can wear the trays for 22-24 hours a day, you can expect the desired results to happen in 6-18 months. Invisalign is most effective for patients who don’t need extensive orthodontic treatment. Those patients should consider traditional braces. Patients with relatively mild cases of crooked teeth, protruding teeth, gaps, or over/underbite issues are good candidates for Invisalign. In some cases, it can reduce or eliminate nighttime bruxism, or tooth grinding. If you enjoy rough-and-tumble contact sports, Invisalign is a better choice over traditional braces. Invisalign is not a good match for patients who need extensive orthodontic treatment, who need canines or premolars rotated, have back-tooth bite issues, or who need teeth realigned vertically. In addition, if you think you may lack the discipline to wear your tray 22 hours a day, you should opt for a different type of orthodontic treatment. This entry was posted in Orthodontics and tagged Braces, clear braces, invisalaign. Bookmark the permalink. Follow any comments here with the RSS feed for this post. Both comments and trackbacks are currently closed.